​Welcome to our website. We believe that our school is a special place, founded in 1841, where children can learn, develop and thrive in a happy and nurturing environment. The school has high expectations of academic progress for all children, and our aspirations for their personal development are rooted in Christian values. Our dedicated team offer a high level of individual attention and guidance, so that all make progress whatever their starting points may be. Strong positive relationships underpin all that we do. We are a learning community and encourage parents to engage with us to play a full part in their children’s education. We hope that this site will give you a feel for our friendly and vibrant school, and we encourage you to visit us and find out more. Following our Ofsted inspection in July 2017, we are again, deemed a "Good School". Our teachers, staff, governors and parents have worked hard together to make our small school a lovely place to learn and work. Inspectors saw that the good quality of teaching has been maintained and stated that 'You, your staff and governors are passionate about the school and strive to ensure that the personal as well as the academic needs of each pupil are met'. ​We are proud of our happy school and the start it gives the children at the beginning of their school education. Thank you to everyone who brought bags into school. We will let you know how much we have raised. Thank you to everyone who wore spots on Children in Need Day and donated. The Duck Race was won by Paul Stacey. Well done for raising £73. 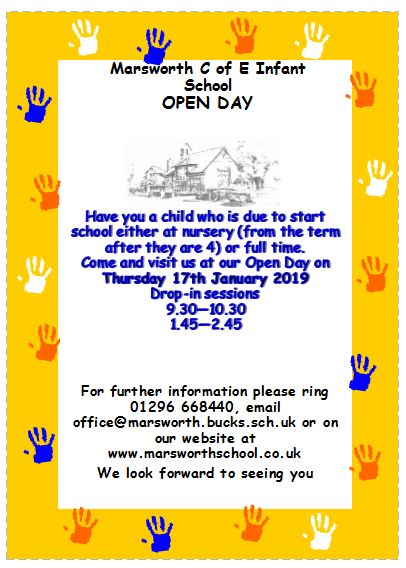 Don't forget to check out the Parents and Friends of Marsworth sections for letters and any information about future events.